Update 2018: Eczema is still something we struggle with every day in our house. 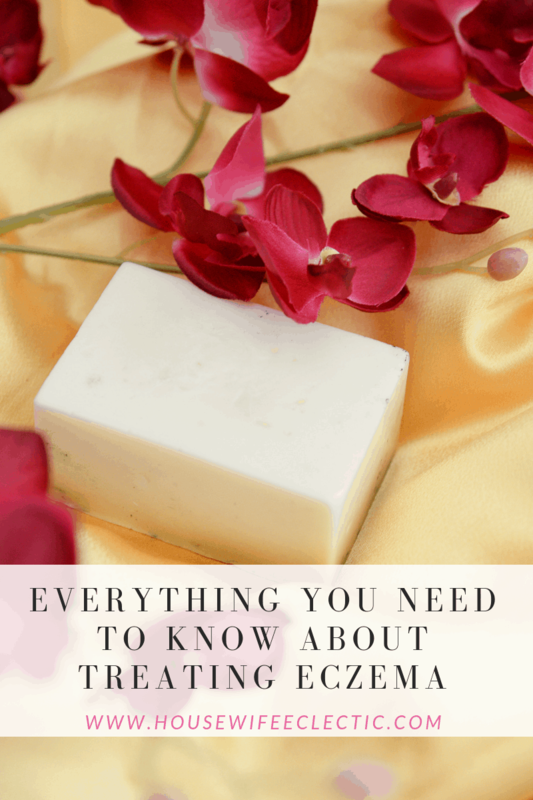 Every winter I come back to this post and update it with tips, tricks for How to Treat Eczema. If you have questions or tips, feel free to leave them in the comments. We can all use all the help we can get in this! I remember the first time we brought my daughter to visit Utah during the dry, cold winter. We had problems with her skin in Texas, but I could usually manage them and had a steroid cream for when I couldn’t. We were in Utah for all of three days when her skin was so bright red and hot to the touch that she could barely stand to be touched. We raced her to the hospital where the flabbergasted doctor said it was the most severe case of eczema he had ever seen. He gave us more steroid creams and not a lot of answers. It took going back to humid Texas to even make a dent in the damage a short visit had done. Flash forward three years and we found ourselves living in Utah, dreading the winter. My daughter’s first winter in Utah, she was on oral steroids three times. It was the only thing that kept her functioning. I was grateful for them but nervous as heck about them. Then this last year I met a 10-year-old girl that had eczema about as bad as my daughter, but she also had heart and lung problems from years of oral steroid use. It was then we decided even three times a year on oral steroids was too much, we needed to find new ways to combat eczema. It has been a long and frustrating road complete with infections from scratching too much, tears from trying new creams and my daughter asking me every night why she can’t be normal. It absolutely breaks my heart. 1. Bleach Baths. For my 5-year-old, I fill the tub about 1/2 full and add a quarter cup of bleach to it. The purpose of the bleach baths is to kill the bacteria growth on the skin and allow the skin to heal faster. I wouldn’t do this for someone with mild eczema, but if you start noticing crusty skin, this is a good next step. For my daughter, I pull her hair up in a bun so it is out of the way and let her play. I remove all the rugs and such from the floor beforehand in case the water splashes out. 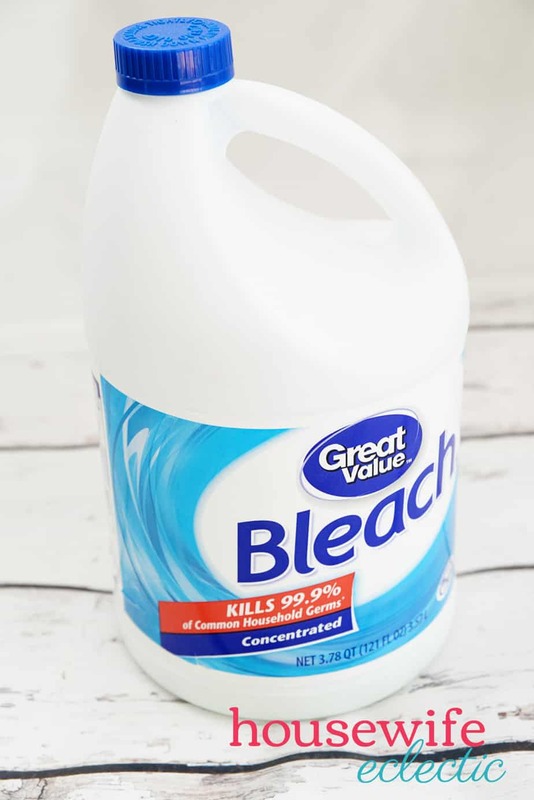 Bleach baths: Add 1 cup of bleach to a full bathtub and soak for 10-15 minutes. A bleach bath helps kill the bacteria that can be living in the affected portions of the skin. Baking Soda: When the eczema is causing severe itching, a baking soda bath can give a lot of relief. Simply sprinkle baking soda in a warm bathtub and soak for 10-15 minutes. 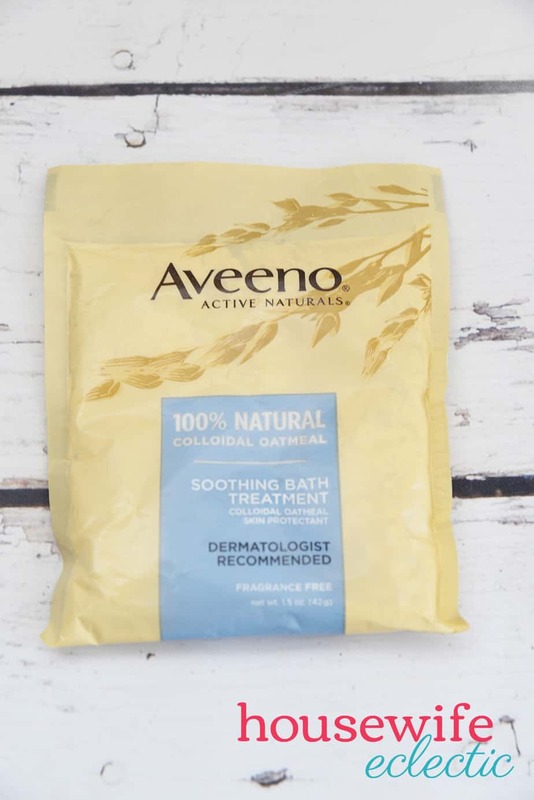 Oatmeal Baths: We do a lot of oatmeal baths in our house. They seem to be very good at soothing my daughter’s skin. Buy natural, plain oatmeal at the store and then grind it in a food processor until it is very fine. Sprinkle over the bottom of the bathtub and mix in. 2. Keep the air moist. I run a humidifier 100% of the time, all year round. I run one at night in her room and then I have a second one that stays in our main hallway that I run all the time. The goal is to keep her skin from drying out in the first place. This is the humidifer we have and it works great. 3. Avoid all chemicals. We use free and clear detergent, dryer sheets, soaps, and cleaners. Keeping chemicals out of our house has made a HUGE difference. The little things matter when it comes to chemicals. You can just replace your detergent without replacing the dryer sheets too and you can’t just wash their clothes in free and clear, you need to wash everything. When I first replaced our detergent, I was using the old detergent on my clothes just to use it up. I found it was still causing her trouble even though she was just being exposed by contact with me. 4. Wet Wrap. Take a bath and then gently pat dry the skin. Cover the skin in moisturizer and then a damp ace bandage. Wrap the damp bandages in dry bandages. Leave the bandages on during the night and remove them in the morning. Wet wrapping helps rehydrate the skin in ways that a layer of lotion can’t do on its own. 5. Allergy test. Often times people with severe eczema have underlying allergies that keep their skin broken out. My daughter has food allergies that keep us on our toes when it comes to her eczema. Limiting or eliminating exposure to allergens can dramatically improve eczema. 6. Find a cream that really works. We have tried everything. Almost all of the creams that everyone recommends literally fry my daughter’s skin. She screams and cries as the cream burns and we sit with fans trying to cool the burning before throwing out another cream. It is awful in every sense of the word. 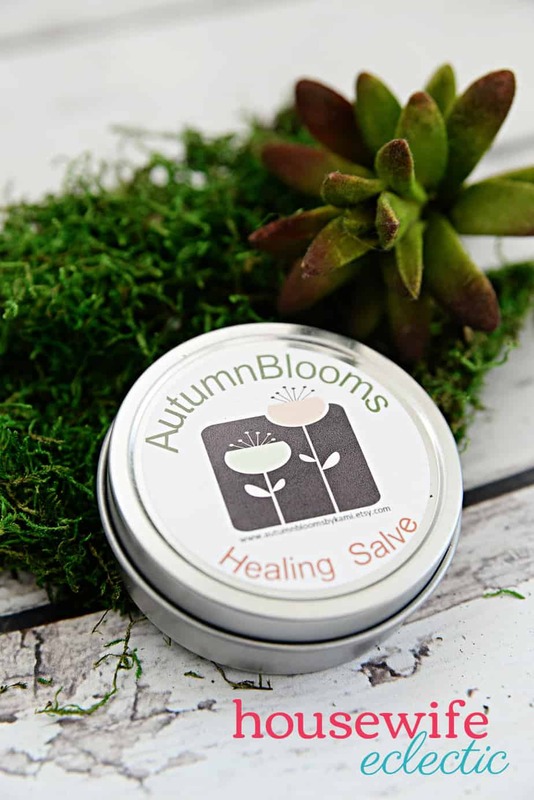 Healing Salve by Autumn Blooms – This Salve is the whole reason I discovered Autumn Blooms in the first place. My sister began talking about this salve and all of the wonderful things it was doing for her child’s eczema. When it first came, I was nervous to apply it to my daughter’s eczema, so first I used it on a friction rash on my wrist from my fitbit. The rash was gone in a day! After that I felt more confident using on my daughter and it has done wonders for her. 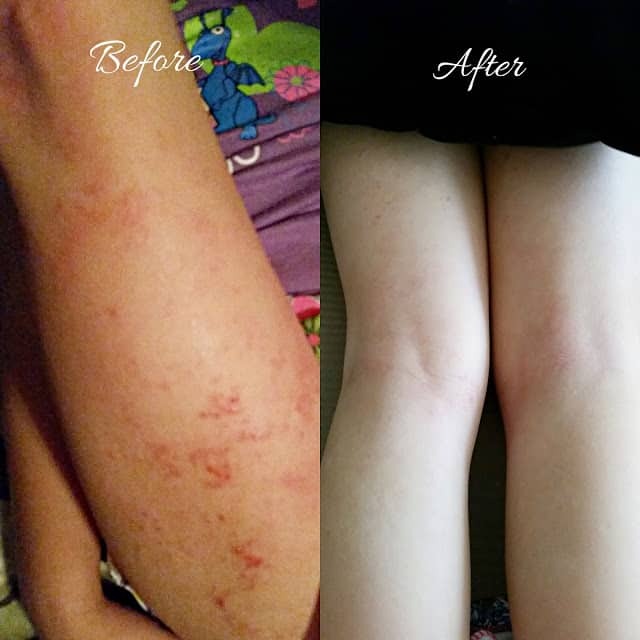 I have been really impressed with what it can do for sensitive skin and those with eczema. 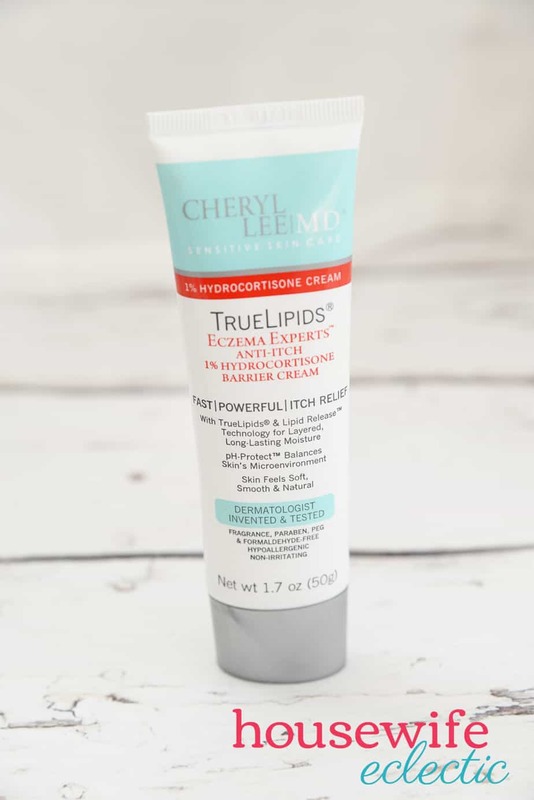 It completely clears my daughter’s skin up AND it is affordable! I don’t feel like I have to ration it. I use it when we need it. I wish I had before and after photos! This is a great product! 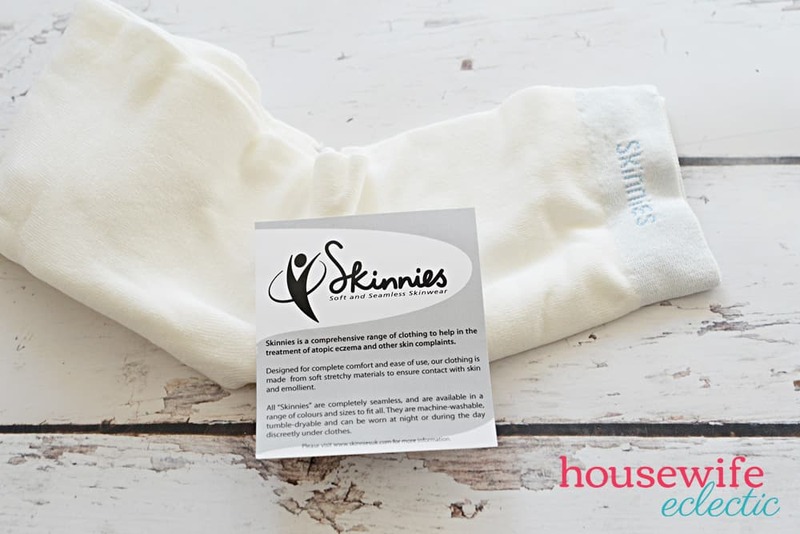 Skinnies are clinically proven therapeutic clothing for eczema treatment. They are cut with a revolutionary technology that means that there are absolutely no seams. Seams are common itch points, so this eliminates that entirely! They are a smooth, simple design that my daughter loves to wear under other clothes, so she gets the look of jeans with the comfort of her Skinnies. These garments are designed to reduce friction through everyday movement of your bodies, which improves temperature regulation, reducing heat and sweating that can make itching worse and further irritate the skin. The first time I had my daughter try on a pair of Skinnies Leggings she refused to take them off. They are amazing for under her school uniforms and she is upset every time I take them to wash them. We need more pairs! These are also perfect to use for wet wrap therapy! I cannot recommend this system enough. 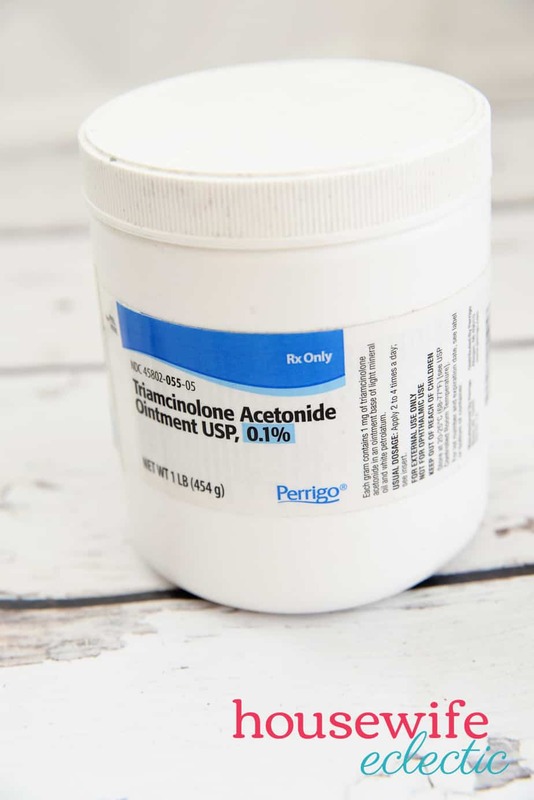 Basically the Cheryl Lee MD creams for eczema work with your skin to help seal the skin against infection and irritants. It really works and it doesn’t burn or sting going on which is more than I can say for most lotion. My big complaint with this one? It is expensive. I find myself rationing it and groaning when the container is gone. I often try other remedies first so I don’t use this one up. As hard as this one is to stomach price wise, you can’t argue with our result photo below. 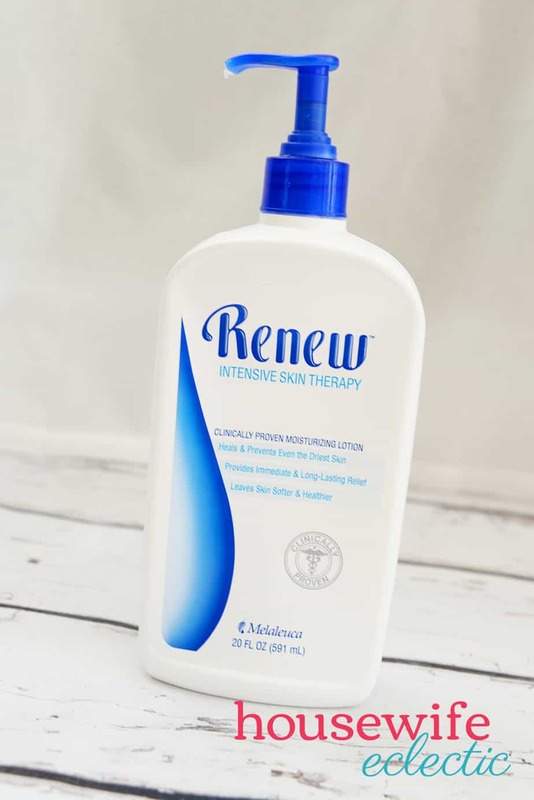 Renew is the absolute best all over lotion I have found. It doesn’t burn when it goes on, even over sensitive areas and it is excellent at keeping healthy skin healthy. It is our go-to for all over moisture. I love it so much we use it for our whole family. The only thing that is frustrating about this product is that Melaleuca is a membership company that you have to buy from monthly. This is a great basic prescription steroid cream. It can come in a big tub so you can slather it all over problem areas. You are only supposed to use it a few days at a time but it is great for getting areas back under control! I call this prescription the big guns. This is what works when nothing else does. It can only be used a few days at a time, but it is the thing to ask your doctor for when you just can’t get a flair up under control. Every year, this post grows longer and longer but I hope our experience and trial and error will help someone find relief a little faster. 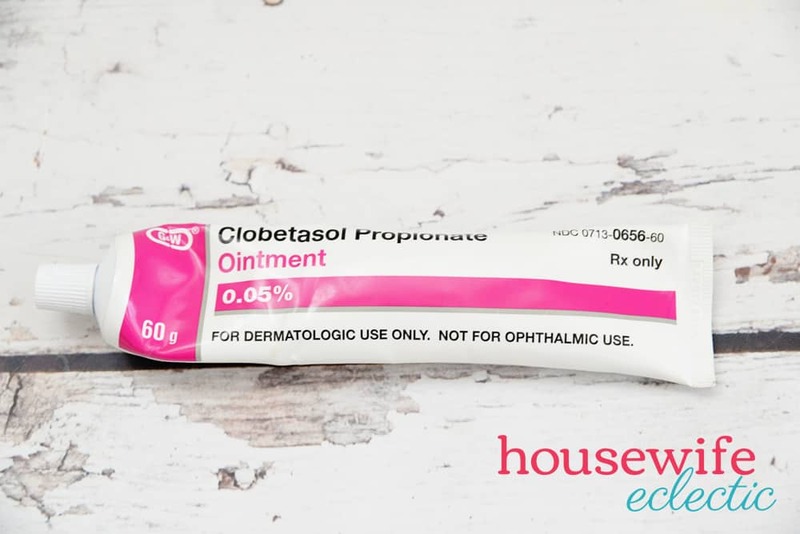 What have you found to work for eczema in your house? I'm so happy you found a solution,my niece deals with this too and it's not fun. I'm definitely sharing this with my sister in hopes that it will work for them as well. Glad you found some stuff that works for you! Poor thing! Glad you found something to help out. I'm glad you found something to help with that. I'm sure its not pleasant to have at all. That is SO sad. Your poor little girl…my son has some of this in the winter and lotion burns him too..thank you for the personal recommendation. Ouch that looks super painful, bless her heart. I am glad you found a product that helped clear this up and give relief! Wow what a difference. I am so happy you found a solution. This is great!! I am so glad you all have found what works best for you. I grew up with this and can totally relate to how your daughter feels. I love that you have found this stuff. It looks great!! Oh wow. I feel so bad for her. I am glad you have found some relief for her. It was really raw before. I'm so glad you found a way to calm it all down! My nephew had such severe eczema when he was young that he would have large open wounds in his hair and my sister would always get ugly looks. Thankfully he grew out of most of it. I'm so glad I saw this. My husband has the same problems with his legs from eczema. Nothing has worked and he's always itching and miserable. I'm definitely checking this one out. I am so looking into this! Both my kiddos have eczema!